Why hello there 2016, and hello all of you! I took a little break from the blog over Christmas to spend some time with my family, stock up on inspiration and finish decorating my apartment. So, today I thought I’d share a little sneak peek of my dining area, or more importantly, my new gorgeous chairs! I have dreamt about these Fritz Hansen chairs for ages and when we bought our new apartment, they were the first thing I ordered. The delivery time for these beauties was quite long (about 8 weeks) but let me tell you, they were well worth the wait. I went back and forth with the color choice but finally decided to mix it up a bit and ordered them in white, black and grey and I absolutely love the result! 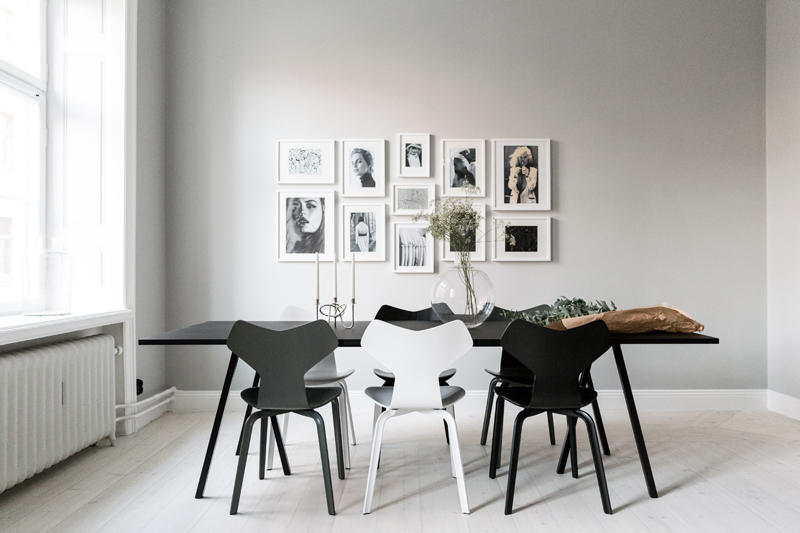 Mixing chairs is a fun & easy way to spice up your dining area, but to pull it off, consistency is key. Always make sure the chairs have one element in common – shape, hue or material. If you’re mixing chairs with completely different shapes, stick to one color or material to keep the look harmonious. Or, do like me and go for chairs in the same style but pick a different color for each chair to add some drama! CHAIRS Fritz Hansen ‘Grand Prix’ / Nordiska Galleriet. TABLE HAY ‘Loop Stand‘. VASE Skruf ‘Pallo’ / Nordiska Galleriet. CANDLE HOLDER Svenskt Tenn. WALL PAINT Farrow & Ball ‘Pavilion Grey‘.